Our efforts have quantifiable impact. Volunteers collected blankets and children's coats to send to refugee camps in southern Turkey. The drive was held from November 7th - December 4th, and donations could be dropped off at more than 20 sites around the area. Click here to read more about the #GiveUpYourBlanket drive. On October 16th, Rocktown Rallies threw an amazing party to welcome newly arrived refugee families. Over 50 refugees resettled in Harrisonburg in the month of September, including 25 children. Over 300 people attended the party, excited by the chance to be hospitable. All in all, it was a magical night that afforded everyone who attended an opportunity to make new friends, and to demonstrate what it means to live in the "Friendly City." The Explore More Discovery Museum Youth Advisory Board received an anonymous donation for $500 towards the purchase of a toy for each refugee child resettling in Harrisonburg during the month of September. There are no Syrian refugees arriving in Harrisonburg at this time, but refugees from other areas are resettling in our community. Many of these refugees are children. 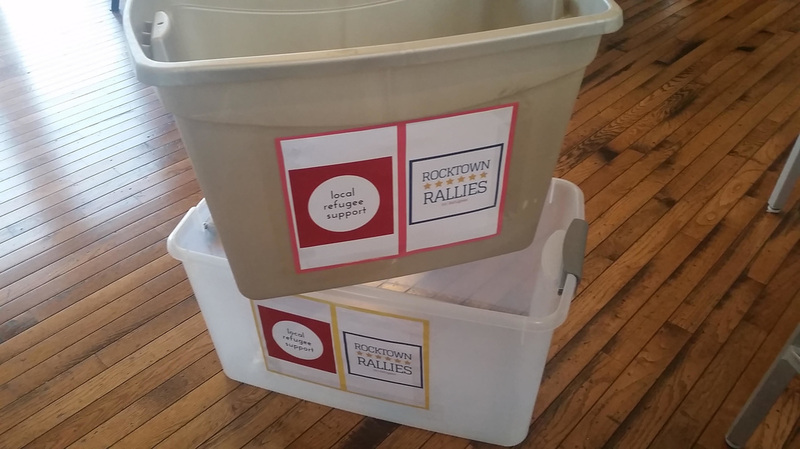 We are so proud of Witt Scafidi, a local student who was inspired by Rocktown Rallies to help our local refugee resettlement agency gather supplies for refugee families. He coordinated a supply drive at both Montevideo Middle School and Cub Run Elementary School. A very special thanks to Witt for taking on this initiative! ​Rocktown Rallies volunteers were at the International Festival at Hillandale Park on September 26th. Volunteers spread the word of how to help Syrian refugees abroad, as well as refugees resettling in our community from other countries. They gathered 185 signatures for our open letter to Senator Warner, Senator Kaine, and Representative Goodlatte.